Join us for a service presenting inspiration and musical offerings from many of the faith traditions represented in our greater Fresno community. Clergy and faith leaders are invited to process into the service. We will gather for processional at 5:15. Love offering will be taken to support Community Food Bank Please bring a plate of fruit, vegetable or sweets to share in community following the service. Out of respect to our hosts, it is asked that there be no tobacco or alcohol used on the premises. Please bring a plate of fruit, vegetable or sweets to share in the community following the service. Tours of the new Sikh Temple will be provided by our hosts following the service. 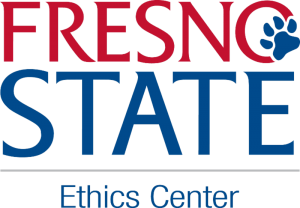 The Sikh Coalition, in collaboration with the Ethics Department at California State University, Fresno invites you to a free screening of “Waking in Oak Creek” – a new documentary that tells the story of a community working together to overcome tragedy after six worshipers at a Sikh gurdwara are killed by a white supremacist. The film screening is sponsored by the Sikh Council of Central California, the Punjabi Sikh Awareness Society at CSUF and the Interfaith Alliance of Central California. A discussion will follow the screening and will be facilitated by the Sikh Coalition. Join fellow meditators behind the Gandhi Statue in the Fresno State Peace Garden this coming Friday, August 8 at 9 a.m. for the largest Synchronized Global Meditation in History. Please Join Us for a Global Peace Meditation on August 8. In order to accommodate the schedules of the new officers the IACC will meet the third Thursday of the month starting May 15, 2014. 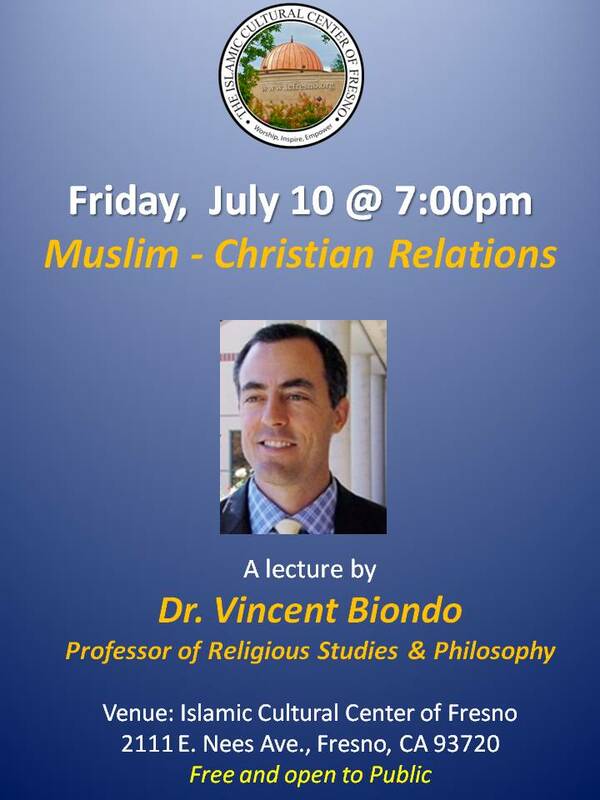 The meeting will begin at 4pm at the Islamic Cultural Center of Fresno. 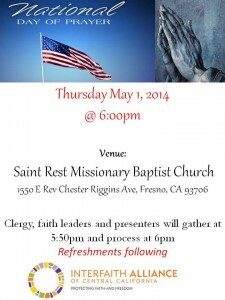 The annual Interfaith National Day of Prayer will be held Thursday, May 1 at 6pm. The St. Rest Missionary Baptist Church is hosting this year, it will be in their gym. Please join us for the Central Valley VOAD meeting. We will be discussing the Drought and how we will be effected, what role VOAD will play in disasters like this and what resources are available. All organizations, no matter how large or small, that have an interest in responding to disasters, have a place at the VOAD table. Who? : Youth, 9 and older, & as long as you have a creative inner child, come join us and together we will write verses of Rumi’s poetry in different languages. 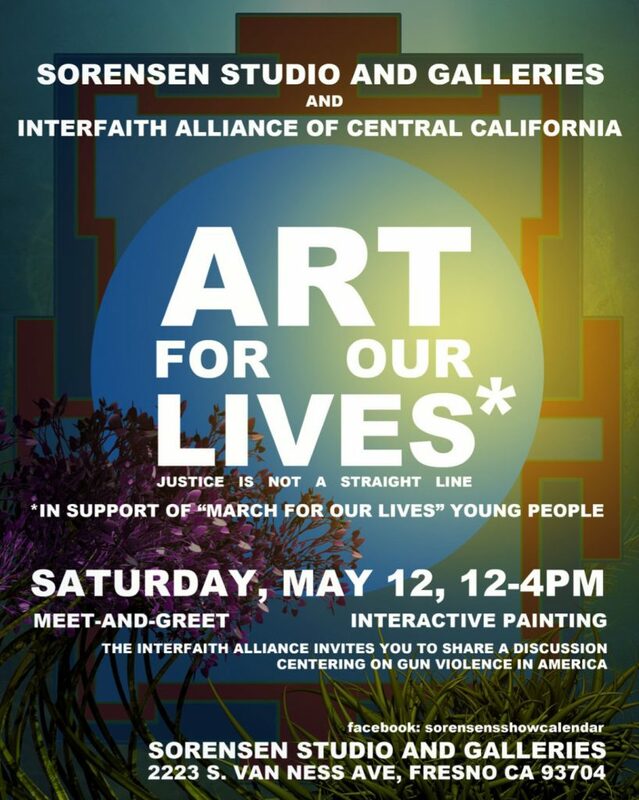 Free and open to all. Refreshments will be provided, but you can always bring a snack to share. 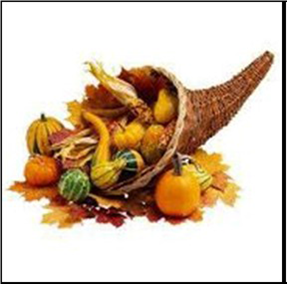 The annual Interfaith Thanksgiving Service will be held on Sunday, November 24 at 5:30 pm. The service will be hosted by the LDS Fresno West Stake, 3375 W. Sierra Ave.
Join us for a service presenting inspiration and musical offerings from many of the faith traditions represented in our greater Fresno community. Love offering will be taken to support Community Food Bank.